This sun-tracking photovoltaic array is part of the renewable energy microgrid test bed project led by electrical engineer Joel Kubby. The Center for Sustainable Energy and Power Systems (CenSEPS) at UC Santa Cruz is tackling the challenges of energy sustainability with a focus on innovation in clean-energy technologies. In recognition of the center's efforts, the Silicon Valley/San Jose Business Journal has named CenSEPS a finalist for the 2011 Energy Award in the category of "Best Conservation Leader (government/nonprofit)." Based in the Baskin School of Engineering, CenSEPS is exploring the societal implications of new renewable-energy technologies, promoting the use of these technologies to create sustainable communities, and preparing a new generation of engineers and scientists to address the need for increased energy efficiency and reduced carbon footprints. "We have a lot of projects under way, developing education programs and working with the City of Santa Cruz and other partners on renewable energy projects. We're looking at what can be done on a local scale to develop renewable energy in a practical way," said Michael Isaacson, CenSEPS co-director and Narinder Singh Kapany professor of electrical engineering. CenSEPS and the other finalists for the 2011 Energy Awards will be honored at an awards ceremony on Tuesday, May 3, at the Computer History Museum in Mountain View. CenSEPS projects include the Santa Cruz Coastal Renewable Energy Project, which is exploring the potential for solar-, wind-, and wave-energy technologies to make the Santa Cruz Municipal Wharf self-sustaining. UCSC faculty and students led by John Vesecky, professor of electrical engineering, have created a sensor system that measures available energy in the sunlight, wind, and tidal fluctuations at the wharf. Researchers are compiling and analyzing data from the sensors to guide the design of a renewable-energy system to supply power to the wharf. The group has a conditional permit from the California Coastal Commission to install a small wind turbine on the wharf and monitor it for potential impacts on birds. Students are also surveying businesses on the wharf to find out how amenable they are to monitoring their energy use for energy conservation purposes. "The wharf project will give us data that policy makers need to deal with regulatory issues. If we can figure out how to do this here in Santa Cruz in a way that is acceptable to the community, then we can use that as a model for other coastal communities," Isaacson said. 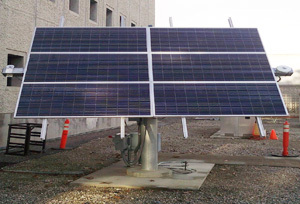 Researchers affiliated with CenSEPS have also established a renewable energy microgrid test bed at UCSC's Advanced Studies Laboratories at NASA Ames Research Center. Microgrids are localized networks that may offer a reliable way to integrate intermittent sources of renewable energy into large-scale power distribution systems. The UCSC project, led by associate professor of electrical engineering Joel Kubby, incorporates wind and solar energy generation, an electric vehicle that provides energy storage capacity, and state-of-the-art software for optimization of system operations. It is used both for research on renewable-energy microgrids and as a teaching resource. CenSEPS researchers hope to replicate this microgrid concept at the Hartnell College campus in Salinas and at the Lower Quarry on the UCSC campus, Isaacson said. On the academic side, the center is creating a new curriculum in the Baskin School of Engineering focused on sustainable energy technology, electric power systems, power electronics, and resource planning. According to studies from the U.S. Department of Energy and other national organizations, a serious need is emerging for more power and energy engineers to replace retiring engineers, modernize the grid, and solve engineering challenges associated with new energy technologies. CenSEPS is developing a teaching environment to produce the next-generation workforce needed to meet the energy and power needs of California and the nation. Another of the educational programs that CenSEPS is involved in is the California-Denmark Summer Program on Renewable Energy, led by professor of electrical engineering Ali Shakouri, which brings together students and researchers from three UC campuses and leading universities in Denmark. The program, held alternate years in California or Denmark, allows students with various academic backgrounds to interact and work together on final projects that target energy problems from different angles. "In our academic programs, we try to bring together students from the social sciences and engineering to work on common projects, so they're looking at the social implications of the technology as well as the technology itself. It's important to develop appropriate technology that will be accepted by the community," Isaacson said.